When the water is turned on and automatically contracts back when the water is turned off. 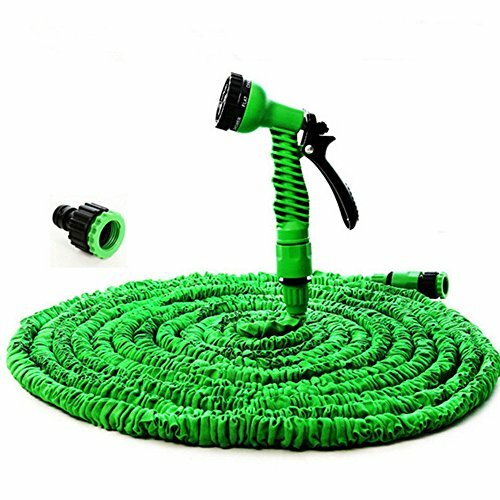 The HOSE is extremely lightweight and will eliminate the drudgery of using heavy, bulky conventional hoses. 1 hose connected to the faucet, please use small water flow.Do not install nozzle. 2 wait for hose expansion, when you want to use, please install the water gun. 3 after use, please close the tap. Innovative design: it can quickly expand to 3 times the length of its original size when water is turned on, and fully retract to the original length when water is turned off. We use the durable latex hose pipe! Not rubber!--Inner tube is made from natural latex, very strong and durable! The hose is wrapped with high-class oxford cloth, both beautiful and wear-resistant.Supplied with a spray nozzle, which is made of long-lasting and durable ABS plastic. 7 adjustable modes, including shower, flat, center, cone, soaker, mist, jet.Ideal for many watering and cleaning uses, such as gardening, car washing, house cleaning, etc.